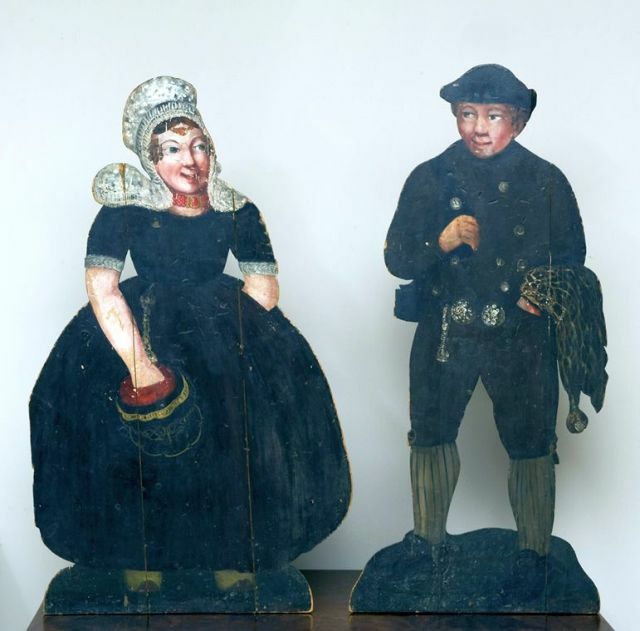 Pegs and 'Tails | Seventeenth- and eighteenth-century English and Irish furniture &c.
or, a potted history of dummy boards. 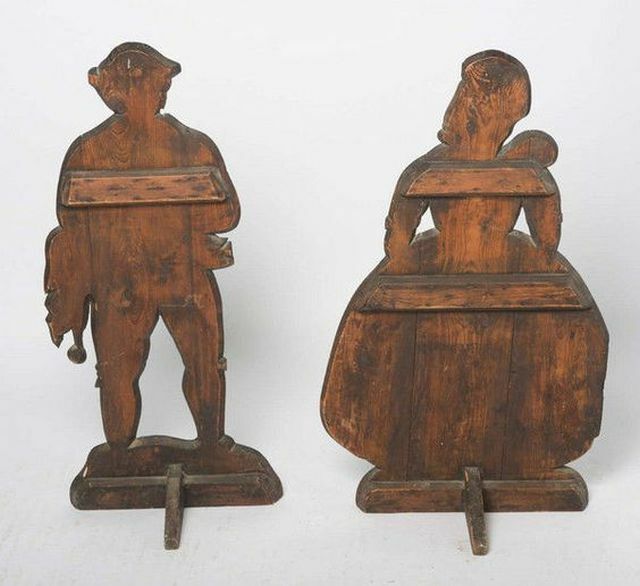 First appearing in the seventeenth-century, dummy boards are painted (usually on wood) silhouettes of people and occasionally animals (figures 1 & 2). Fig. 1. 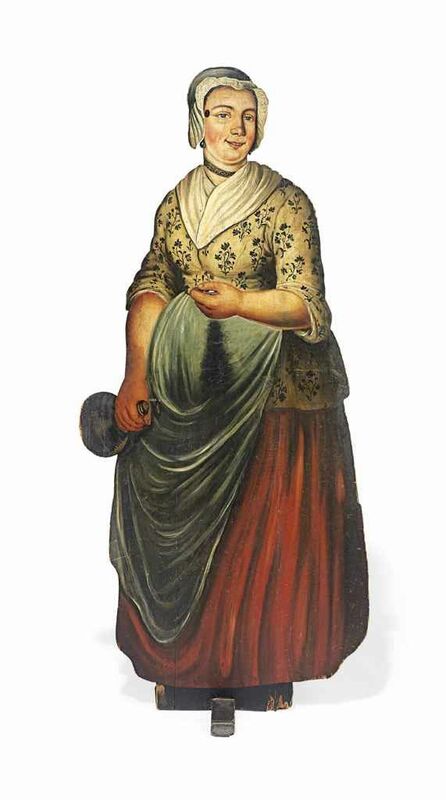 Eighteenth-century painted pine dummy board depicting a woman of some wealth. Fig. 2. 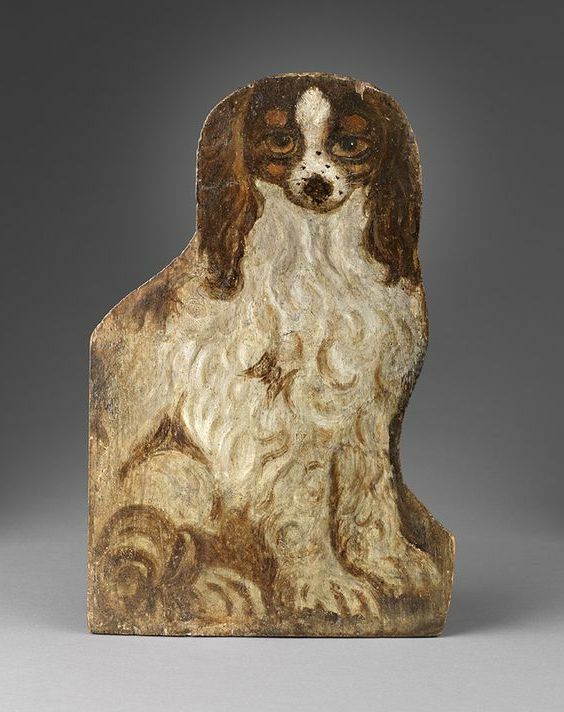 Eighteenth-century dummy board of a spaniel. 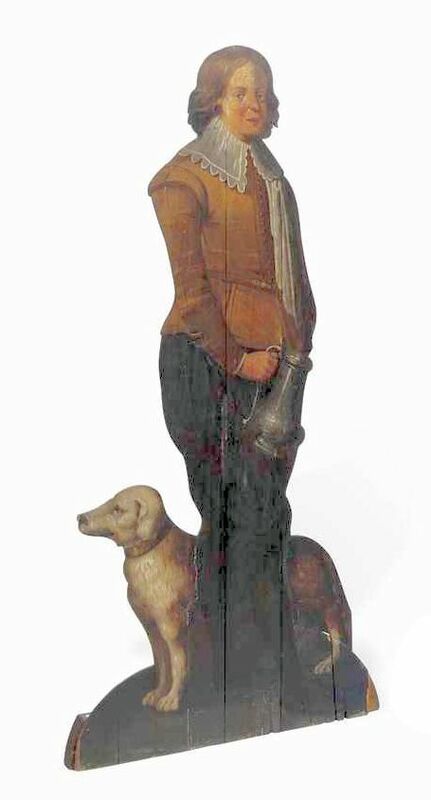 Animals and domestic figures are normally life size, though some dummy boards were created larger than life in order to intimidate or scare the observer viz., wealthy households would often post effigies of their supposed private militia (figures 3-6) around the house and grounds to frighten off or deter would-be thieves whilst the family was away taking the waters or on a Grand Tour. Fig. 3. 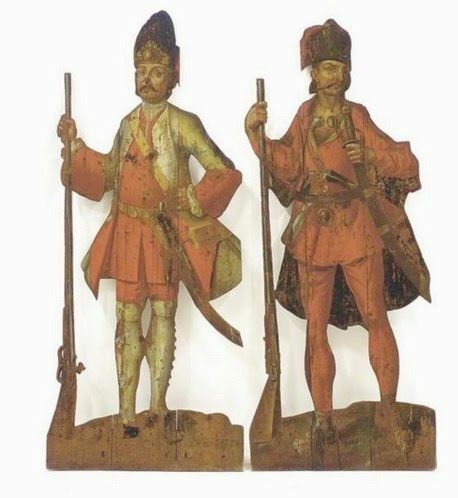 Pair of eighteenth-century militia men. Fig. 4. 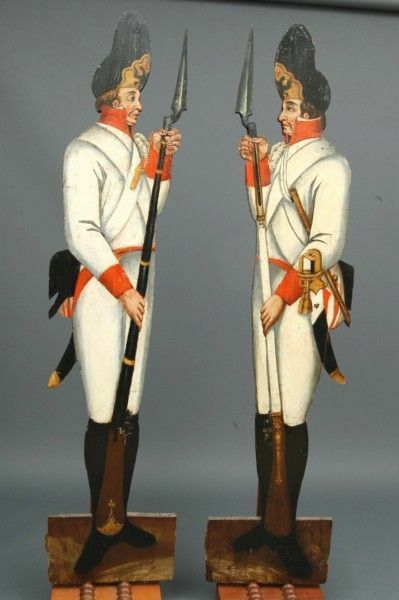 Two eighteenth-century soldiers. Fig. 5. 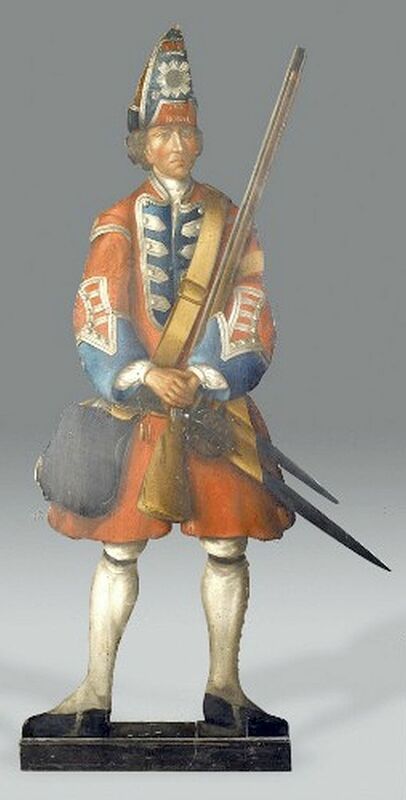 Fusilier dummy, circa 1750. Fig. 6. Nineteenth-century hussar dummy. One infamous Lancastrian decided to line the three colonnades of his mansion with dozens of dummy boards portraying armed soldiers. An acquaintance and frequent antagonist in neighbouring Yorkshire took affront at the outrageous display and mounted an attack on the house with his own militia, cutting all the ‘soldiers’ down in a hail of lead balls. 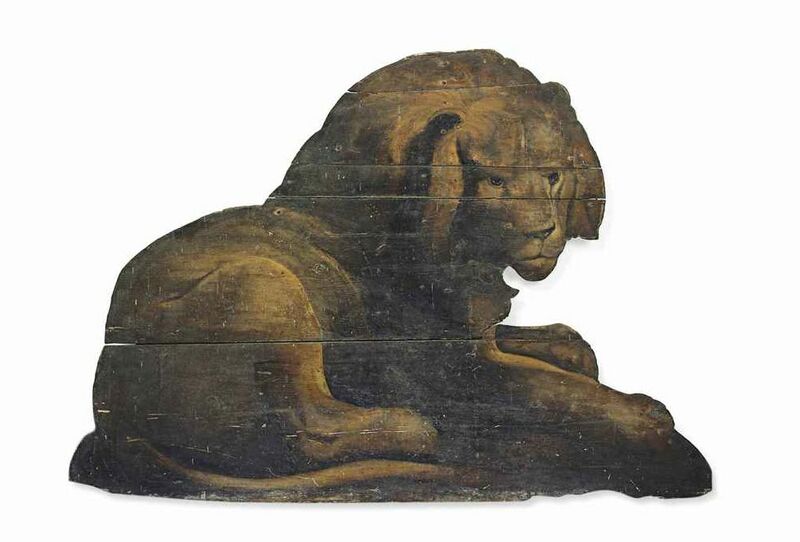 Much more common are the domestic dummy boards representing pets and exotic animals (figures 7-9) and domestic servants (figures 10-14) which were dotted about the interiors of vast houses to reinforce the impression of wealth and status to the casual observer as they meandered around large rooms and glanced through enfilades. Fig. 7. 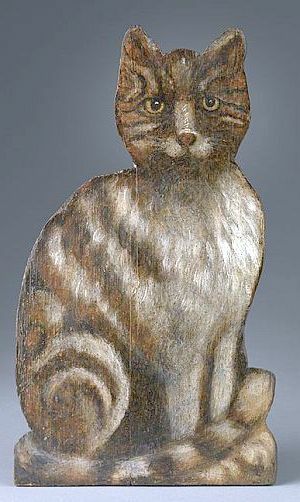 Eighteenth-century painted cat dummy. Fig. 8. 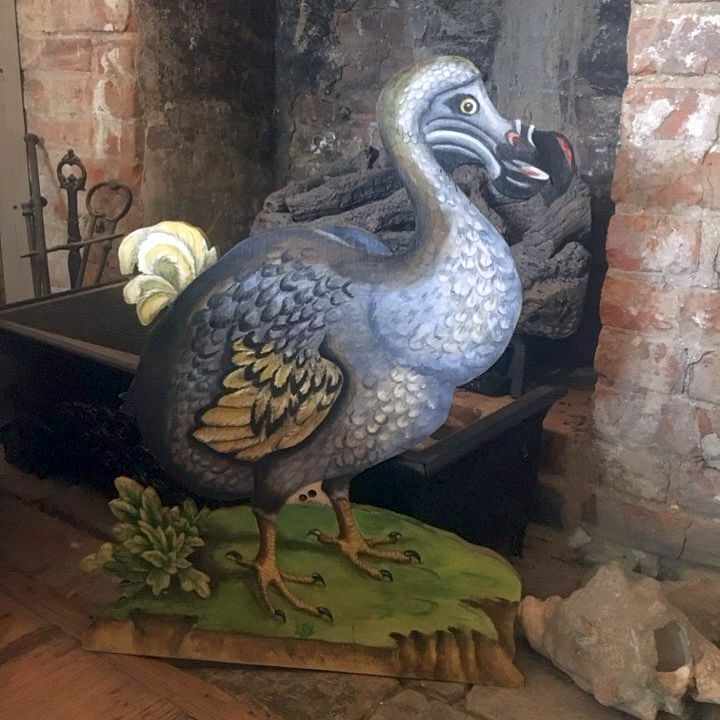 Painted dodo dummy, circa 1740. Fig. 10. 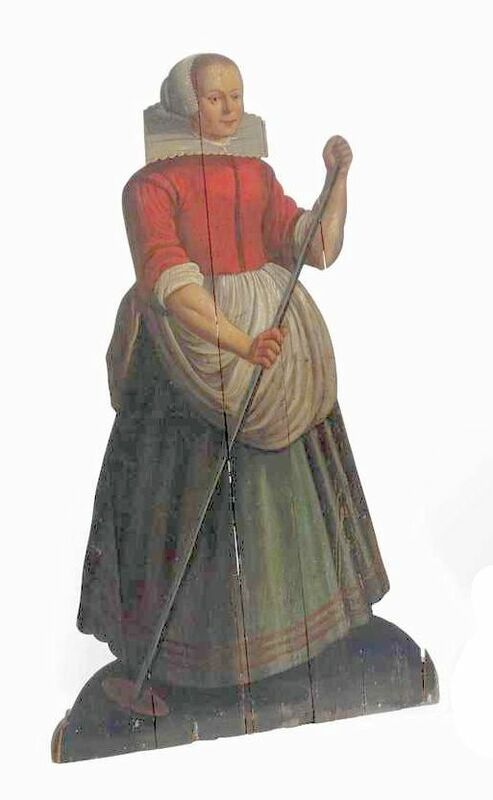 Seventeenth-century dummy maid. Fig. 11. 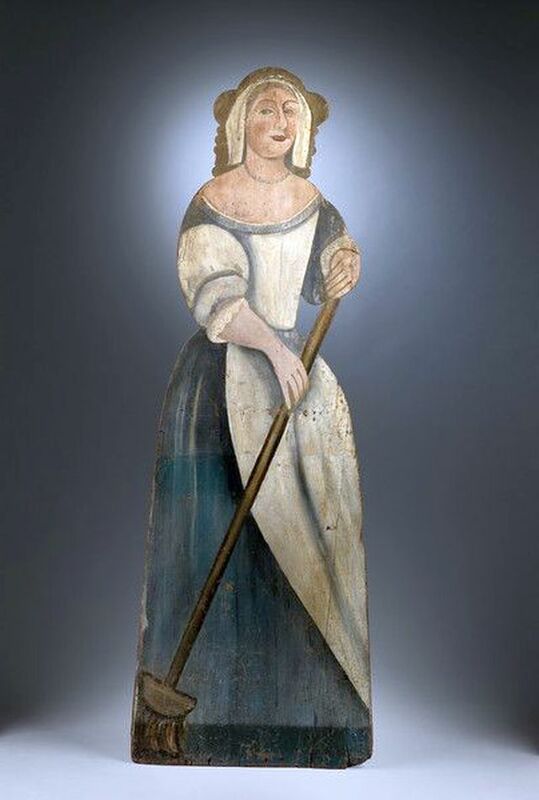 Seventeenth-century maid dummy board. Fig. 12. Eighteenth-century dummy maid. Fig. 13. 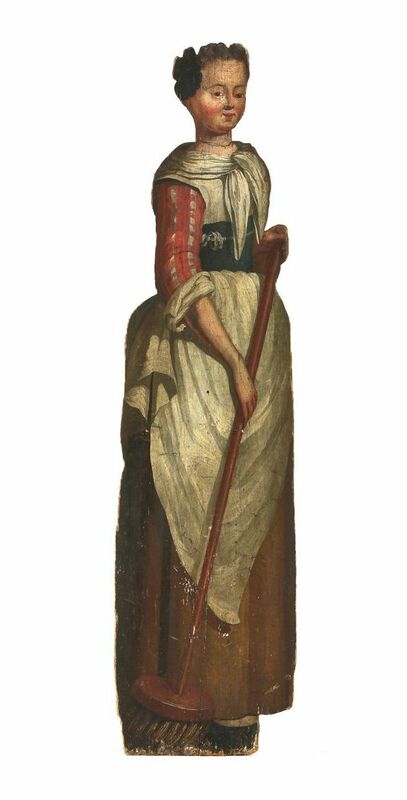 Eighteenth-century dummy housekeeper. Fig. 14. 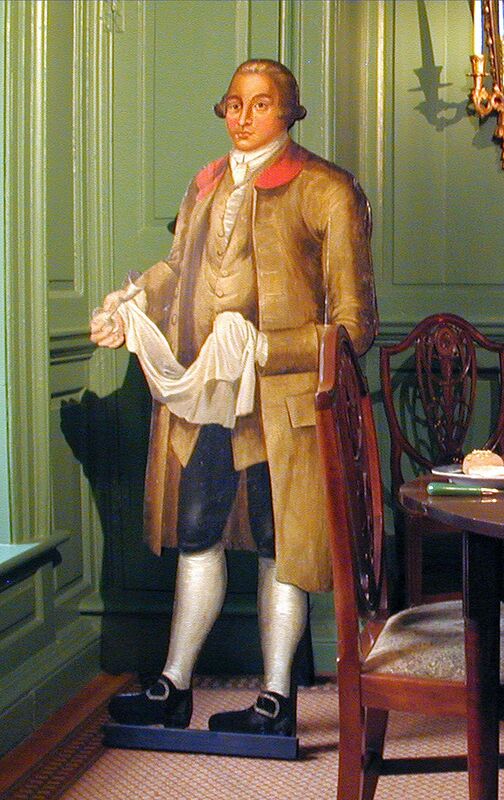 Eighteenth-century dummy manservant. 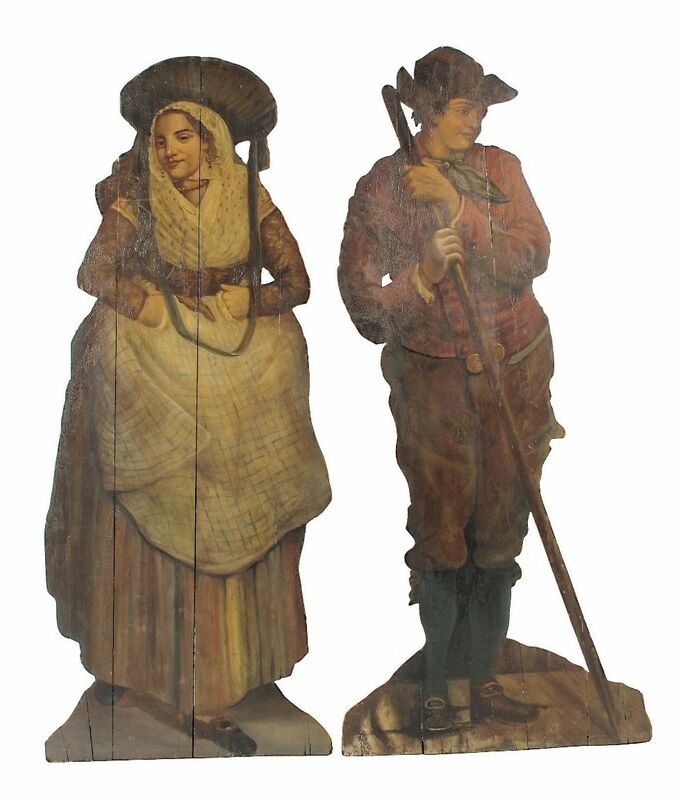 Gazebos and follies were also populated with dummy boards of sightseers – a popular pastime during the latter half of the eighteenth-century – (figures 15 & 16). Fig. 16. … and reverse. Other areas of the grounds were similarly occupied by gardeners and various rustic workers (figure 17). Fig. 18. 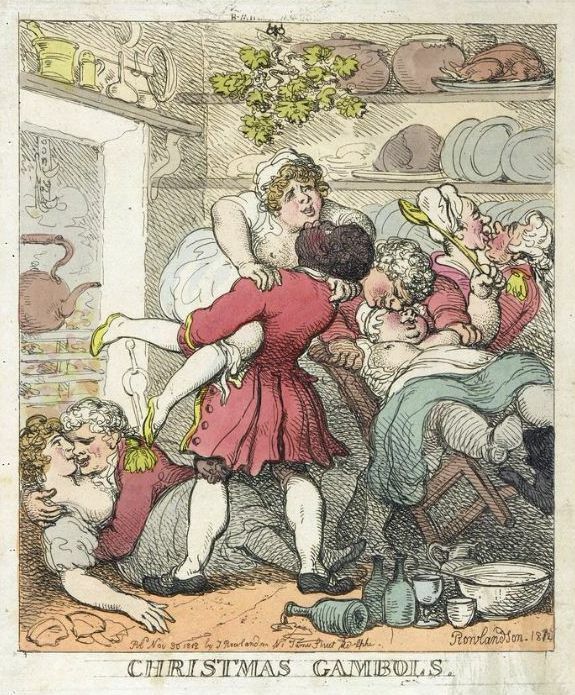 Seventeenth-century partygoer (?). 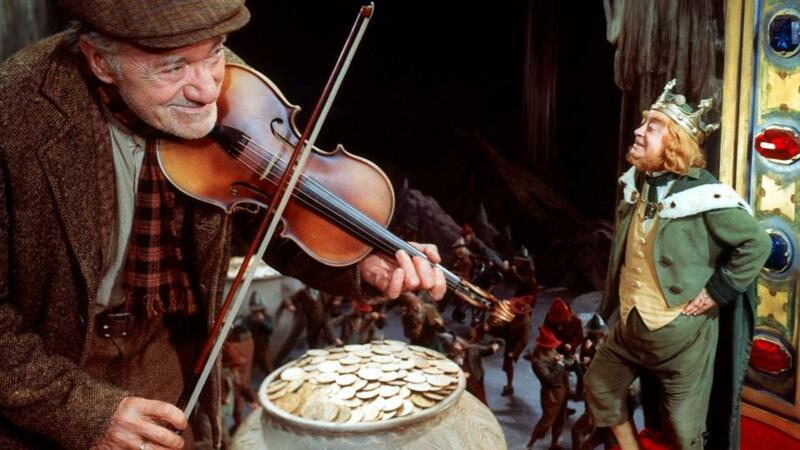 To all Irishmen, particularly those in absentia… happy Saint Patrick’s Day. I came across yet another coffre fort recently. 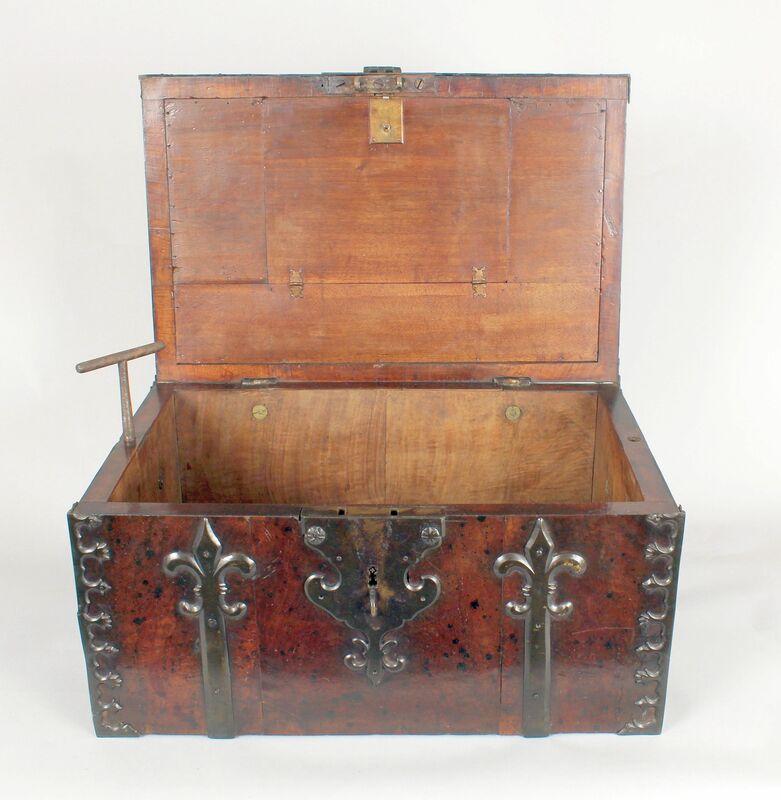 Like the previous examples, this late seventeenth-century walnut, iron and brassbound coffre would have kept money and other valuables safe whilst its owner travelled. By utilising a T-handled key (figure 1), two captive screws (figure 2) enable the strongbox to be secured to a chamber or cabin floor. Cheers to everyone who took the time to read my posts over the past year, and a special thank you to those who commented on them. Wishing everyone happiness and prosperity in 2019. “To a Walnut Dask”, Part II, The Writing Compartment. Part II of Christopher Storb’s examination of John Head’s walnut desk. Writing compartment of the desk attributed to John Head. 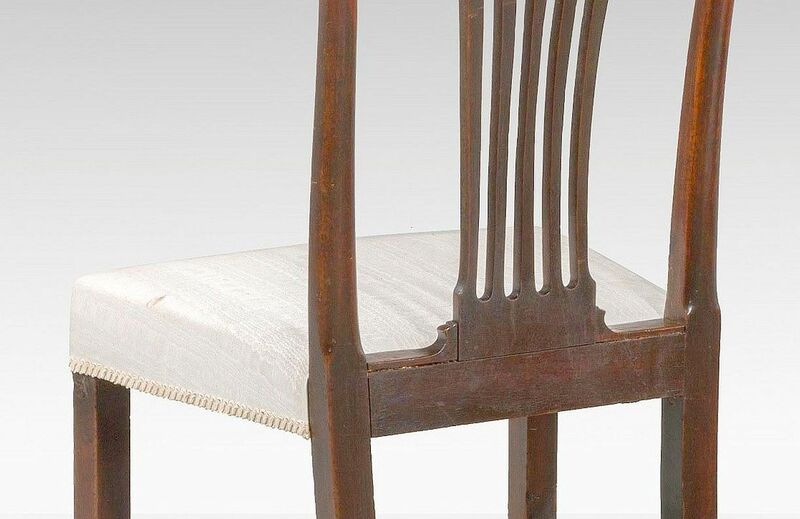 Made in Philadelphia, 1720-1740. Black walnut, hard pine, Atlantic white cedar, yellow poplar, brass, iron. Private collection. For a lack of other surviving desks that can be attributed to John Head’s shop, we have no way of knowing if the writing compartment is typical of his work. 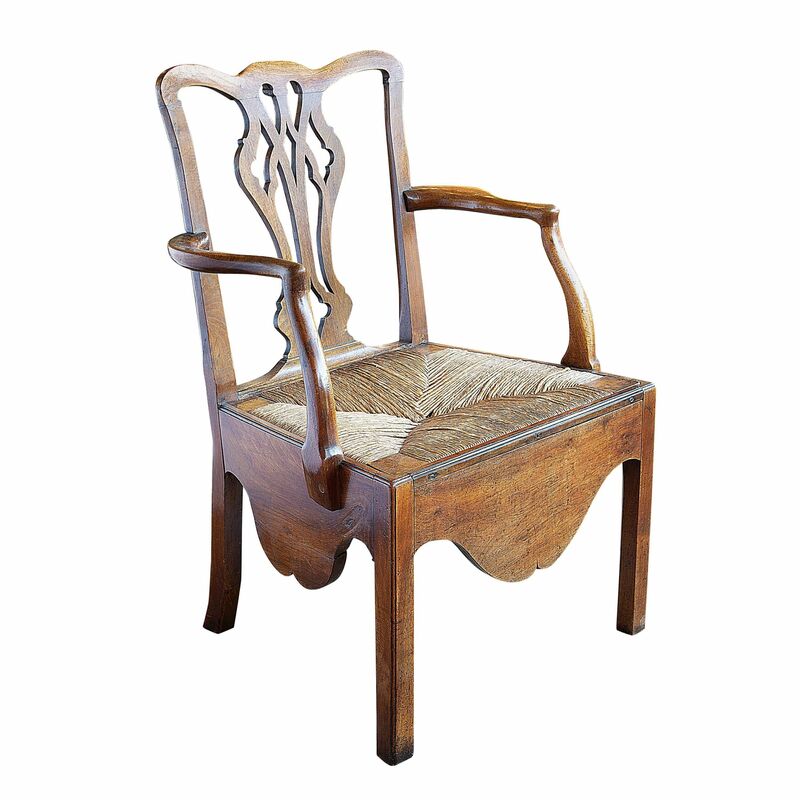 More or less elaborate interiors may account for some part of the range of prices Head charged for desks. When making chairs of this ilk, I like to glue the entire backs together as separate assemblies. I then repeat the process with the front legs/seat rails and finally take the side seat rails and remaining stretchers and glue the whole lot together. I dry-assemble the stiles, back seat rails and backsplats in order to establish the shoulders for the tenons on the tops of the stiles and splats. That done, I form the tenons and cut the mortises in the crest rails to match (figure 1). Fig. 1. 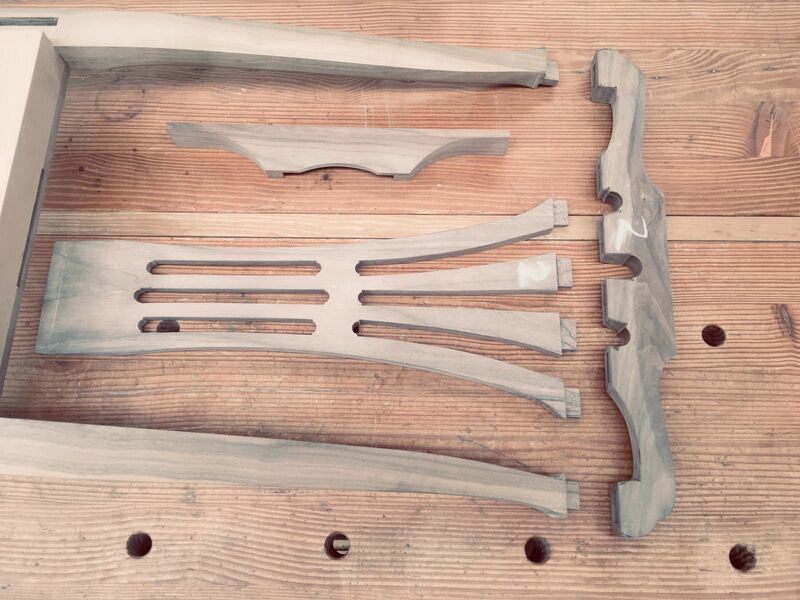 Chair back components. 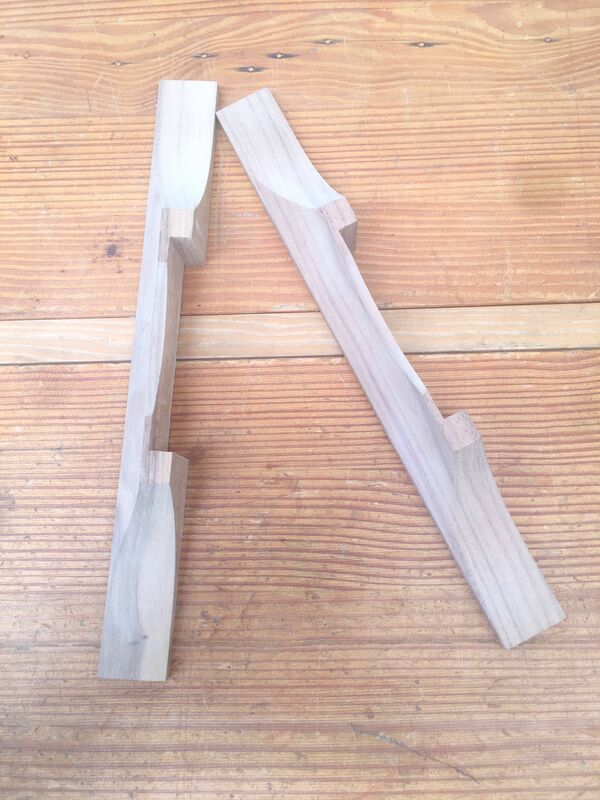 Each component is shaped and rough-sanded except where they intersect with another. As can be seen by the pencil marks (click the above image to enlarge it), the junctures are left oversized until glued and assembled whereupon all are faired. 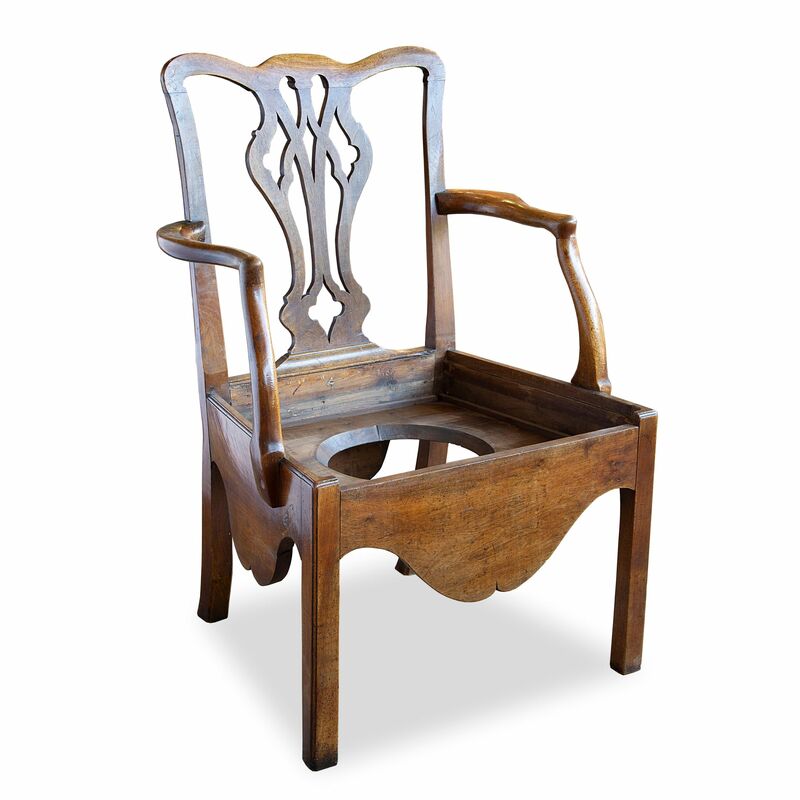 As with these two chairs, it is common for Irish chairs’ splats to be tenoned directly into the back seat rails (as opposed to into fixed shoes) and the shoes – more like ‘slippers’ – simply slip into position against the fronts of the splats (figs. 2 & 3). Each shoe is retained with a couple of headless brads. 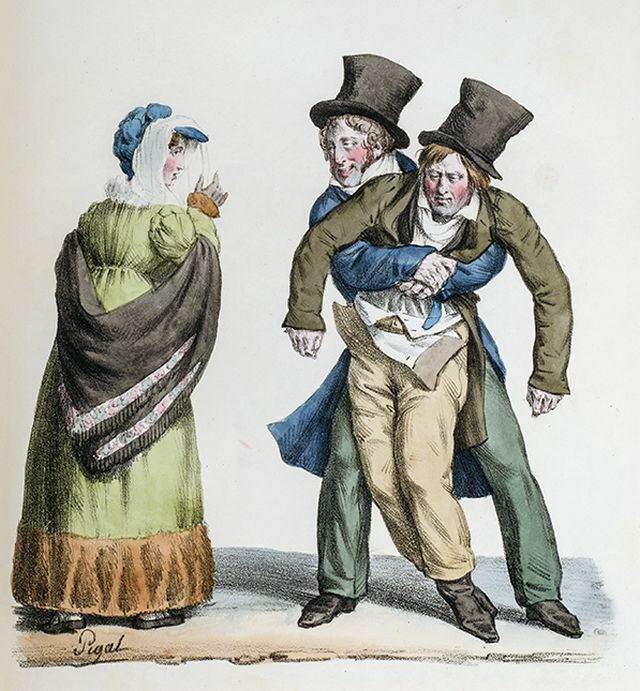 Following on from yesterday’s post concerning a bureau made by the English emigrant, John Head, the American Philosophical Society digitized Head’s account book and has today, made it available to all and sundry. The American Philosophical Society has also published an accompanying book (available here), The Cabinetmaker’s Account: John Head’s Record of Craft & Commerce in Colonial Philadelphia, 1718-1753 by Jay Robert Stiefel. English joiner John Head (1688–1754) immigrated to Philadelphia in 1717 and became one of its most successful artisans and merchants. However, his prominence was lost to history until the author’s discovery of his account book at the Library of the American Philosophical Society. 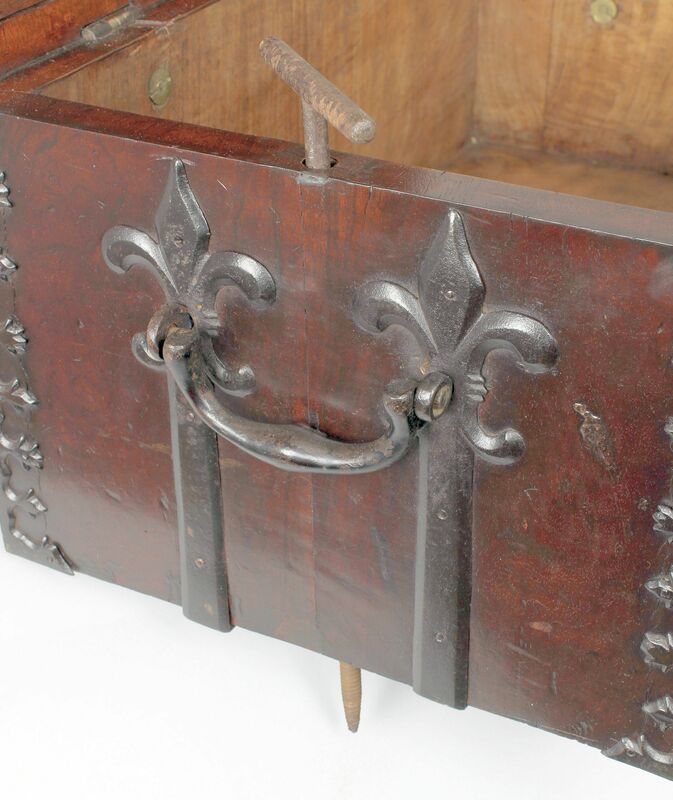 A find of great historical importance, Head’s account book is the earliest and most complete to have survived from any cabinetmaker working in British North America or in Great Britain. It chronicles the commerce, crafts, and lifestyles of early Philadelphia’s entire community: its shopkeeping, cabinetmaking, chairmaking, clockmaking, glazing, metalworking, needleworking, property development, agriculture, botany, livestock, transport, foodstuffs, drink, hardware, fabrics, furnishings, household wares, clothing, building materials, and export trade. Jay Robert Stiefel, historian of Colonial Philadelphia society and its material culture, presents the definitive interpretation of the John Head account book and introduces many other discoveries. The culmination of nearly 20 years of research, this new volume serves as an essential reference work on 18th-century Philadelphia, its furniture and material culture, as well as an intimate and detailed social history of the interactions among that era’s most talented artisans and successful merchants. 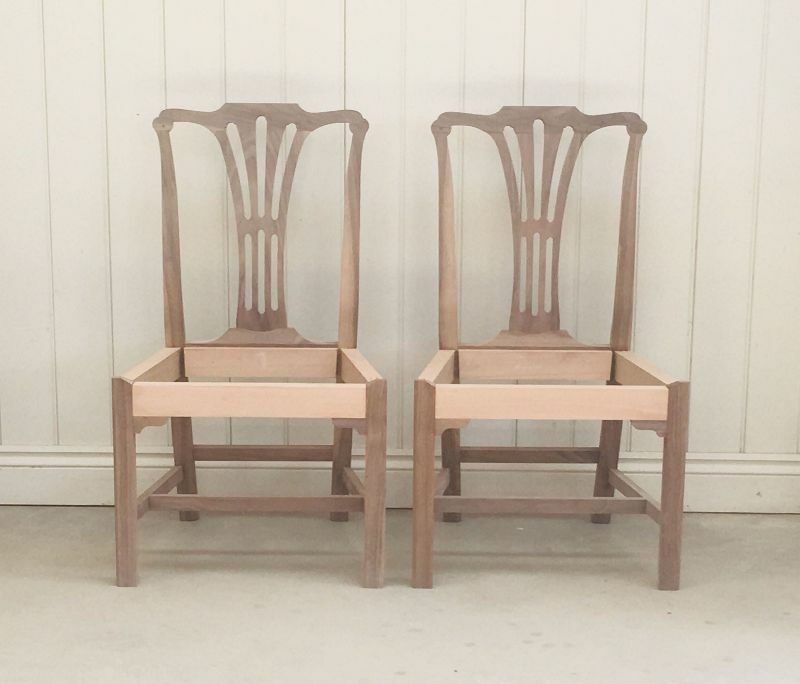 Profusely illustrated and in large format, the book includes a foreword from furniture historian Adam Bowett and an introduction by historian Patrick Spero, Librarian and Director of the American Philosophical Society Library.